The game Stunt Race FX is an arcade racing game developed and released by Nintendo for the SNES platform in 1994. In Japan the game is called Wild Trax (ワイルドトラックス). 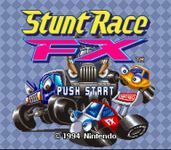 Stunt Race FX was the second game, after Starfox, to be equipped with the Super FX chip allowing the game to use a 3D visual style. The developers could now use 3D polygons, and as a result the game has a more realistic 3D sense compared to other 'flat' racing games for the SNES. The graphical style itself is far from realistic and more cartoon-like, with bright colors and cars with eyes. The Trailer is can only be used in special bonus levels in the SPEED TRAX mode. The 2WD has to unlocked first in the SPEED TRAX mode. The main mode is the SPEED TRAX mode. The racing is in arcade style. The player is racing against opponents as well as against a timer running down. In the lap there are several checkpoints. When the player reaches a checkpoint, he receives additional seconds on hist countdown timer. There are two types of powerups on the tracks: Blue (Increasing the Boost-meter) and Red (Repairing damage). The game wasn't a big commercial success unlike often the case with Nintendo's own titles. The reviews and critics were divided, but on the whole positive.